Penalty: It shall be unlawful to commence construction of any structure requiring the issuance of a building permit without having first obtained a building permit Failure to procure the proper permit or inspections shall also result in a monetary penalty equal to one hundred percent (100%) of the permit or inspection fee being imposed in addition to the standard fee at the time the permit or inspection is issued or performed (11-1-4 C, Cassia County Code). 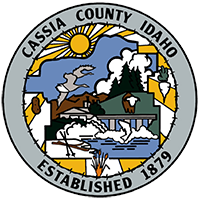 See Cassia County Code 9-8-2 (these setbacks do not apply to subdivision lots) · Minimum Front & Street Side Setbacks (including corner lots) · 54 feet from center of the adjoining street. · Yard Rear & Interior Side Setbacks: · 15 feet (except in Industrial Commercial (IC) Zone—5 feet setback is required) · Accessory Buildings from other structures require at least 5 feet. Agricultural Siting Permits are issued on all structures designed and constructed to house farm implements, hay, grain, poultry, livestock or other horticultural products. If structure used for any purpose other than to house farm implements, hay, grain, poultry, livestock or other horticultural products a building permit is required.